A troubling image haunts me; and I quiet my mind to recall the scene. Last Sunday, here in Kansas City. I stood at the Customer Service cashier at the grocery store near the cemetery in which my parents-in-law are buried. I try to visit them a couple of times each month, and this store carries bouquets of roses in my mother-in-law's favorite color. I typically buy the flowers, drive to the cemetery, and place the arrangement with little human interaction. The clerk gestures; I swipe my debit card; and decline a receipt. On this Sunday, last Sunday, two women approached the Customer Service counter ahead of me. The area has two windows, one with a hand-lettered sign declaring that it provides Lottery tickets only. The three of us hovered in front of the left-hand window, beyond which a short man wearing the store's logo t-shirt stood ready to take our money. But the first of the women had already been through a cashier line in the main part of the store. She dangled a plastic bag from her extended wrist, the small item in it pulling the bag downward towards the floor. Her other hand rested on the handle of a baby stroller, the flimsy umbrella kind. I followed the line of her heavy jacket to the clenched hand, and drew a sharp breath. A stuffed white trash bag sat in the buggy, stretched and bulging with its contents. A stack of clothing protruded from beneath the bag, layers of dark wool and faded denim. I drew my eyes back to the woman: Eighty, maybe; with short blunt-cut white hair. Under the winter coat a shapeless sweater covered her bulky torso. I met the eyes of the other person in line, who shook her head very gently, right, left: a brief blink. Nothing more. The woman had let her outstretched hand fall down as she spoke to the cashier. I tried to understand her complaint. It seemed she felt she had been cheated. I thought it was two dollars, she repeated, and I could see inside her nearly toothless mouth as she spoke. I pinched my brow; one does not expect to see homeless people at 105th and Holmes Road in Kansas City -- north and east of here, certainly, but not this far south, not here, in a decent neighborhood far from the roar of Troost Avenue's traffic and the neighborhoods north of 75th Street, north of 47th even. The woman repeated her accusations. I thought it was a two, she told the man again. She charged me five dollars. I shouldn't have had to pay five dollars. I thought it was two dollars and she never told me it wasn't. The man behind the window murmured something but a stalemate had definitely ensued. I thought about the dearth of cash in my own wallet, wishing I had three singles that I could give the woman. I had my debit card and a twenty. Our little group had fallen silent. The woman's hands trembled as she guided the plastic bag with her five dollar purchase over the handle of the stroller, letting it fall against the fabric seat. She grasped both handles, but before she turned away, she told the man that she thought the clerk should be fired for cheating her. I'm sorry, ma'am, he told her. I'll speak to her. Her shoulders sagged. She wheeled the little buggy around, its burden shifting. The lady behind her gave way to let her pass and she went through the automatic doors of the exit so slowly that I almost moved to stop her. But I did not. I bought my flowers and went to Jay and Joanna's grave. I got the headstones cleaned, arranged the new roses to replace the old ones which a deer had eaten and scattered on the ground, and stood gazing at their names for just a few minutes before turning to go home, north on Holmes to my Brookside neighborhood. A half-hour later, I stood on the porch drinking tea and thinking about the bags of leaves on the curb. As I gazed toward the sidewalk, a walker came into view -- a woman -- white hair, substantial girth, shapeless sweatshirt over black knee-length shorts and white ankle socks. She strode forward with purpose, a small weight held in each hand. Her arms swung as she trudged past my house -- rapidly, though: much faster than I myself could walk. I guessed her age at seventy, maybe more. She pitched her body forward, bending her swollen knees, dragging her weight. She swiftly moved beyond my house, determination marking her face and a sheen of sweat rising on her broad brow. When the street in front of me fell motionless, I sipped my tea, thinking, not for the first time, about what kind of old woman I want to be. Then I went into the house and started cleaning, while a pot of coffee brewed on the counter and the dog slept beneath the table. Morning's darkness tricked me into thinking that I had not slept. A glance at the clock revealed the truth: Seven straight hours of slumber, despite two glasses of wine and a salty dinner. Call me crazy but a third night of sleep in three months, albeit not sequential, seems like a trend. I've not had three nights of sleep in as many decades, so I'm going to take this as a sign that I should drink more wine or that the new medicine might be working. Dark chicory coffee and a brief stretch push my brain to something near functional. The house still nestles behind closed shades. The dog sleeps though one eye opens when I pass her bed. NPR rattles on the radio but not loudly enough for me to follow the stories. It's Saturday; I do not have to work, though work's worries linger. The slight ring of tinnitus dances in my brain. I pay it no mind: Like my sleeplessness, the ringing in my ears has begun to diminish. I can tolerate its current level. The new drug which I'm taking either works or is the world's most successful placebo, and I do not care which truth you pick. Though I'll probably never walk right, and I still have raging neurological pain, and my cardiac spasms have not abated; nonetheless, I count three nights of more than two hours' sleep at a time. Three nights. That might not astound most; but for me, the fact that I typically don't sleep more than two hours in a row and lie awake for hours flavors every waking moment. Anyone with insomnia understands the staggering contemplation of seven straight hours of sleep. I am reminded, as I sip my coffee, of a rueful statement that I made yesterday. I wasn't supposed to live this long, I groaned. Really: I wasn't. On Valentine's Day in 1998, I lay in a bed at St. Luke's Hospital and cast my eyes out a dirty window, the pale winter light falling on me so weakly that my tired eyes did not flinch. An aide stood by my side with a tray of flavorless food. I shook my head but she pulled the table towards me and clattered the dishes, shaking her head, lifting lids, letting the food's odors waft into the room. I closed my eyes. You weigh next to nothing, the woman admonished. I glanced at her face and let my eyes flutter shut again. I knew how much I weighed; I knew what nothing felt like; I knew that how I felt was next to nothing. I can't breathe, I told her, and she hit the panic button. A ruffle of activity later, I had a mask pressed to my face with oxygen flowing. The doctor had been called. My pulse-oxygen read normal but my respiration read dying. Nobody understood. I heard murmured talk of the Psychiatric Unit. I turned my head back to the window and thought about my six-year-old son. Late in the afternoon, another aide pushed the door open carrying a staggeringly tall vase of roses. She set the heavy glass down where the uneaten food had once rested and pulled the card out from its little plastic stick. I studied the typed words. Two dozen red roses and a note proclaiming affection from someone whom I barely knew. I cast the card down beside a little shower of petals that had fallen from the bouquet. The doctors came then, pushing aside the rolling bedside table with its flowers and the discarded love note. They re-took all the vital signs that the aides and the nurses had taken during the frenzied activity following my pronouncement. They read the charts; they looked at each other; they pulled on the wires that monitored my weakly beating heart. You're not getting better, one observed. We think your body is just wearing out. At the rate you are going, you might live six more months, said another. We just think your body has taken all it can take. Your lungs are just tired. I pressed the button to elevate my head. The men jumped back as I rose toward them. I pushed the clumps of uncombed hair back away from my face. Dying? I snapped at them. Dying? You think I'm dying? Wearing out? That's your diagnosis? I felt hysteria rise in my throat, the same throat which had been sore for five years without any of the white-coated wonders finding a solution. Well I'm sorry but I'm the single mother of a six-year-old boy who has nobody but me to take care of him. I stopped, chest heaving, tears rising in my eyes. I'm afraid I can't die, not yet. I will not die! So just go back and run some more tests. Or get another opinion. But. I. Will. Not. Die. They filed out as quietly as they had entered. Night descended on my room. A nurse came and turned on the soft light above my bed. She brought me fresh water and a bowl of soup. I looked at the pale yellow of the simmering broth. I thought about my son. With the nurse standing by, silent, waiting, I lifted the spoon and skimmed the soup, sipping, letting its warmth settle in my frail chest. A year or so would pass before a knock-down drag-out fight between two doctors would result in a shake-up on my medical team. When the dust settled my condition began to improve. Joseph Brewer, the first Infectious Disease Wizard to take charge of my condition, diagnosed my decline as hypercoagulability caused by reactivation of the virus which had originally caused my medical condition, back in the 1950s when doctors diagnosed all childhood illnesses as bacterial. But the odyssey that has led me to the farthest western shores of these United States and the Infectious Disease Clinic at Stanford Medical Center began on that Valentine's Day, when a pulmonologist stood in all his white-clad arrogance and told me that I had six months to live. And while I rejected his prognosis, I admit, now, here, that I have lived my days since then as though I knew their number and had no need for permanency. On March 04th of this year, my second Infectious Disease Wizard told me that if he had his way, I would live to be 100. I once promised my son that I would live to be 103, I told him. His face beamed. Better still, he crowed in his delightful Colombian accent. 103! And what a quality life it shall be, from here on out! he added. If I have my way! After last night, with seven straight hours of sleep and feeling (almost) rested, I might just be able to believe him. P.S. This story might seem a little self-absorbed. But I share it for two reasons. First, because many people who read these Musings have known of my many medical issues over the last decade and a half, and deserve an update as inadequate thanks for their kindnesses to me over the years. But, second, I share this because so many people, myself included, have ailments which plague them and doctors that misdiagnose them. A dozen doctors, maybe more, have told me over the years that "nobody can have the symptoms you describe, they just don't make sense." Of course not -- to the closed mind. If you, or someone you love, has ever been told that doctors can't help you, keep asking. Somebody, somewhere, will have an answer. The doctor who gave me six months to live called Dr. Brewer a "quack" to his face, over my prone body during one of my hospital admissions. I fired that doctor and gave myself to Dr. Brewer's care and here I am, still alive. Ironically, that doctor himself died fairly young, a year later. I take no pleasure from his death nor the painful mourning that his wife and children must have felt. But I am alive, because Dr. Brewer intervened and tried something novel that the other doctors dismissed as quackery. And now, at this juncture in my life, I've given myself to the ministrations of another doctor willing to take a chance on me by giving me a drug recently approved for my virus in part because of clinical trials at Stanford. So never give up; never surrender; and don't let the naysayers rain on your parade. Sleep crashed me against the night's rocky shores until close to three this morning, and two hours later the forgotten alarm jarred me back to consciousness. Were I inclined to blame someone for last night's difficulties, I would place the yoke on my own shoulders. My friend Brenda took me to dinner last evening. I ordered wine before she arrived, a rich Pinot Noir which she mirrored in her choice. I know better. Red wine cramps spastic muscles and it did no less to me last evening. Coupled with the jangled nerves from the Chocolate Gateau which I ordered and Brenda kindly shared with me (to spare me the full burden of its after-effects, no doubt), the cramping intensified and I fell asleep late and exhausted. Light streamed in my window when I awakened, three hours after the radio blared out news from KCUR to interrupt my first thirty minutes of fitful sleep. I glanced at the clock: 7:45 a.m. And suddenly, a memory burst forth from the murky depths of my brain, Walter Mitty style. It happened in 1973. 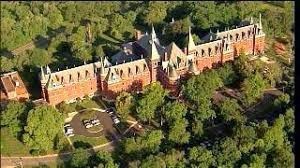 I was working as a ward secretary at St. Vincent's Psychiatric Hospital. I had been co-opted to serve as an ECT witness when a third was needed. I followed the nurse Sister Kenneth Anne and the psychiatrist Dr. Craig to the inner corridor where the treatments took place. I stared at the back of Dr. Craig's head, with its thinning red hair and growing bald spot. In his rumpled, stained green suit and brown, worn shoes, he looked like Willy Loman, about to take another road trip, looking for sales, just before the deadly turn in the road. Sister Kenneth Anne stood taller than Dr. Craig by most of the short white veil descending from the crown of her own head, the veil which covered smoothly combed brown hair. She squared her shoulders when she walked. Her narrow back kept straight but easy; the full skirt of her working habit swayed slightly against her stockinged calves, a few inches about her impeccably white duty shoes. From the rear, I admired the way she walked behind Dr. Craig but at her careful pace, not deferential, not subservient, just second. In my rumpled blue polyester clerk's uniform, I felt that I belonged in Dr. Craig's class -- disheveled, careless, inferior to Sister Kenneth Anne's crisp composure. The patient had been wheeled to the inner room by the time we arrived. A male aide stood beside her wheelchair, gazing blankly over her trembling, greying head. She wore an alarmed look, casting her eyes about the windowless locked room in the back corridor, the corridor which itself had been secured by Sister Kenneth Anne from the inside after we left 3 South's own barred passageway. She and the aide wore bundles of keys: His on a black leather belt which he wore low on his dark blue trousers, hers on a hook hanging from the cloth band spanning the waist of her habit. Dr. Craig and I shared the patient's helplessness: None of us had keys. In case of a fire or a sudden need for daylight or air, we would be reliant on our companions' good graces. Mark the time, Sister Kenneth Anne told me. I glanced at the clock. 7:45 a.m. I made a careful note in the chart, a sheaf of printed pages held between two metal plates designed to hang in a chart carrel. Dr. Craig said, The patient seems docile and receptive to treatment, and I dutifully wrote his words beside the time. The aide and Sister Kenneth Anne lifted the patient from her wheelchair and a little whimper escaped her lips. I looked at Sister Kenneth Anne; she shook her head just sightly, enough for me to understand that I should not record the patient's utterance. Then she laid the patient's head on a clean pillow and I saw the woman's eyes close and her mouth begin to move. I recognized the whispered words: Hail Mary Full of Grace, the Lord is with thee. Blessed art thou among women, and blessed is the fruit of thy womb, Jesus. Holy Mary, Mother of God, pray for us sinners, now and at the hour of hour death. Amen. I finished the prayer in my head for the woman had fallen into a kind of frightened stupor, eyes open, face rigid, fear stamped on her doughy features. Her body shrank from the aide's ministrations as he placed the electrodes on the exposed skin of her forehead and on the back of her neck. Sister Kenneth Anne placed a rubber grip in the woman's mouth and coaxed the jaw to tighten. Dr. Craig fiddled with some controls and Sister Kenneth Anne said, again, Mark the time. 8:00 a.m. Dr. Craig flipped a switch and the woman's body went stiff and began to shake. I looked away. A second time; a third. The woman's body lay still. Sister Kenneth Anne took the bit from her mouth and gently wiped away a bit of spittle. Mark the time, Sister Kenneth Anne admonished me again. 8:15 a.m. Dr. Craig turned away from the limp figure on the bed and pushed past me, to the hallway, where he lit a cigarette. I clutched the chart against my chest and waited while the aide hoisted the motionless body back into the wheelchair. Sister Kenneth Anne tidied the room. Sister Kenneth Anne walked out into the hallway and led the procession back to the locked door which divided the darkness of the treatment area from the jarring Fluorescent light of 3 South, the acute ward where Sister Kenneth Anne held reign. Dr. Craig fell heavily into the chair at the chart carrel and grabbed the chart from my hand, scribbling a few lines. He considered what he had written, then looked at the head nurse who stood placidly above him. We've given her 48 treatments, he said lazily. Is her husband still complaining about her? Sister Kenneth Anne shrugged. She did not speak. Dr. Craig considered for a moment, then wrote something else and heaved himself back to his feet. Let's give her a few more, he said casually, and then, winking at me, he left the nurse's station. Sister Kenneth Anne watched him go without uttering even a syllable. The Dutch door clicked behind him and we heard him cackling to one of the aides working the floor. Minutes later, the clang of the outer door at the far end of the wing signaled his departure and Sister Kenneth Anne finally moved. She lifted the small aluminum ashtray from the desk on which he had left it, cigarette butts stubbed into ashes, the whole mess spilling onto the desk's otherwise pristine surface. She dumped the entire ashtray into the trash can, then used her own handkerchief to whisk away the remaining ashes. That man is a pig, she said. Then she went into the little room where the nurses kept their personal belongings, and I sat back down at my station. Out beyond the window which separated us from the rest of the ward, I could see our morning's patient, slumped, still unmoving, silent, parked in her wheelchair outside of her room. The rest of the occupants of 3 South skirted around her, unspeaking, unseeing, as they headed to the dining room for breakfast. As therapy for emotional ills goes, red wine and flourless chocolate cake might well be less permanent than electroshock treatment. But with Brenda's company, and the lovely salmon that I let myself eat at Avenues Bistro last evening, the treats sustained me. Their aftermath passes with the dawn; and now I drink good, strong coffee. I think of that woman, whose name eludes me. I wonder where they all are: The patient; and the boorish Dr. Craig; and Sister Kenneth Anne, whose placid voice and smooth untroubled brow still linger in my mind, though it was all long ago, and far away, in a building which still stands but has now been converted to affordable housing. The events in its back corridors must be long forgotten by all but us few who witnessed them; and even we will soon ourselves sink unremembered into the recesses of someone else's mind. in North St. Louis County, near Jennings, the town of my childhood. I have returned from my adventures in California. The week's accumulation of excitement kept my brain dancing far into the night, with the nerves in my legs tapping the time. Kansas City seems flat and tame after the ocean, after San Francisco, after the shops of Palo Alto and Los Altos. I listen to the roar of the furnace and shake my head. It hardly seems like home. As I flew over the lower Rockies yesterday, memories of other trips flooded through me. Escape to the East Coast after college graduation; a train trip to Washington during high school; the drive to Santa Fe at the end of a summer of sorrow between my second and third year of law school. I have often found myself going somewhere, looking for something; anonymity, perhaps -- four strange walls within which to re-invent myself. I thought about the fatality accident which I saw on the road west of San Jose, and another memory rose to haunt me. The last week of October 1982, I flew to Montana to rekindle a lost love. My two-stage route landed me first in Butte, where I waited for a Big Sky puddle-hopper to take me to Helena. A man wearing a grey leather jacket gestured to me from an open door. Helena? At first, I thought he had mistaken me for someone and I shook my head. The lady at the counter said, Yeah, she's going, and they both stared at me, assessing the safety of letting me on a small plane. I shrugged and shouldered my tote next to my pocketbook and walked over towards the doorway. The man and I boarded the little plane together. He turned left to take his place in the co-pilot's seat and I turned right, surveying the eight empty seats. I heard a voice behind me and realized that another passenger had come into the plane, a nondescript man wearing beige clothing. We sat and watched as the pilot came aboard and a cabin crew member. Everybody buckled themselves into their seats and the engines started. I stared out the window at the ground, falling away. We climbed over the mountains and slipped down again in the Helena airport before I could form my own safety worries. David waited in the otherwise empty building, as the five of us strolled across the blacktop. We gazed at each other, uncertain, unwilling to let the moment own itself. Finally I embraced him and felt the hasty return of my offering in the tightening of his arms. We spent a couple of days exploring Helena, reminding ourselves of our common trend of thought, laughing. Then he decided we should go to Glacier Park for Halloween, and we packed as much food as we could fit into his small cooler. He stashed his insulin syringes and vials of medicine in the glovebox. We headed for the hills. Halfway up the first tier of mountains above Helena, I saw a row of crosses on a pole beside the row. I had never seen anything like that. Mystified, I asked what they were. It marks the spot of a fatal accident, David explained. The number of crosses is the number of deaths. I twisted in my seat to stare at the shrine, receding in our wake as we continued forward. A half-mile later, we passed a caution sign instruction us to slow to 35. DANGEROUS CURVE. David laughed and said, Should we believe them? just as we drew alongside a newly planted metal spike with seven crosses, a bouquet of fresh flowers not yet wilted lying at its base. David stopped on the shoulder and I threw the door outward, unbuckling, sliding from my seat. I struggled across the rocks of the highway's edge and stopped at the metal figure with its sad display of tiny crosses. I ran one finger along the two crosses at the top, tracing their contours, following the metal bar to the five arranged below them. Do you think it was a family, I whispered to David, who stood at my elbow. His arm slid around my waist, unhesitatingly, holding me, not holding back. We stood by the side of the road as cars flew by, drivers honking, staring. The cold Montana wind surrounded us. We reached Glacier Park by mid-day, As we approached from the south, we could see into Canada, where a snowstorm danced on the frigid afternoon air. An hour later, I stood on the edge of St. Mary's Lake trying to discern the outline of the glacier in the murky grey while David gave himself some insulin in the front seat of the car. I felt small. I would never feel anything but small, never, not then, not still, as the bleak air of winter settled in the park around me and David gazed on me from inside his car. 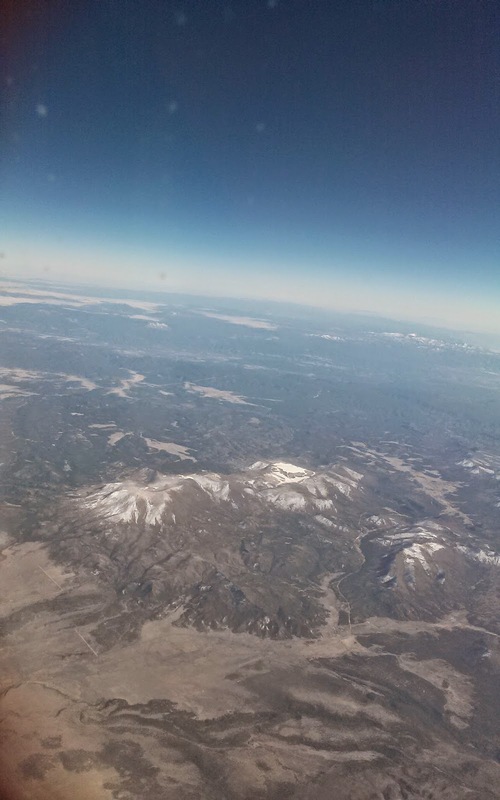 I flew back from California over the lower Rockies yesterday. They lie tame and low, east of Phoenix, a long expanse of friendly hills. I watched them from a window seat in a crowded Southwest Airlines plane. The rows of people around me huddled in jackets with ear phones, iPads, and little bags of peanuts. I kept my eyes on the mountains until they disappeared in the shadow of the setting sun.